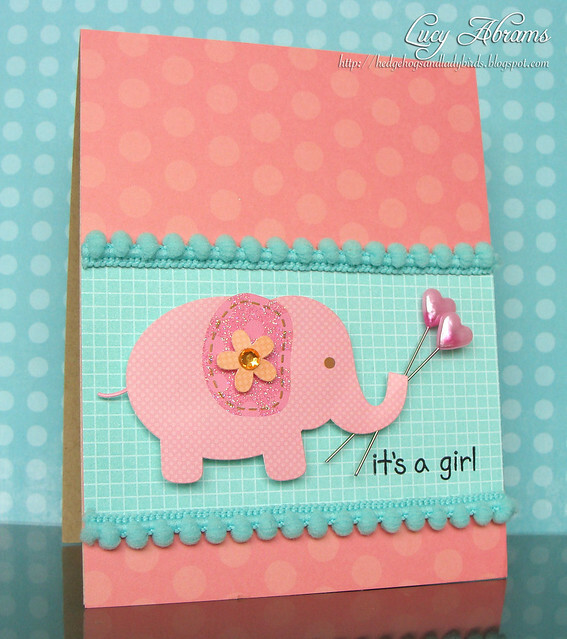 Lucy's Cards: It's a Girl.. and a giveaway. Anyway, today there's a new challenge starting over at The Ribbon Girl blog. The colours are pink, aqua and orange. Initially, I was a bit stumped, then I remembered my new Sugar and Spice stickers from Doodlebug and I was all set. I needed a card for my lovely neighbours - their first granddaughter was born on Thursday. I used Ribbon Girl's yummy Pom Pom trim and pink Heart Pins. I hope you get a chance to enter the challenge. All the details are here. And because I love The Ribbon Girl, I thought I'd have a giveaway in their honour. I have 5 metres of THIS lovely ribbon in pink, red, blue, green and peacock to give away - 1 metre of each colour. To be in with a chance of winning, just leave a comment below. Good luck. Have a lovely rest of weekend. Oh so pretty! Love the elephant card - very cute! How sweet is that elephant - and those heart-shaped pins are perfect. Thank you for more inspiration. That is a gorgeous card. Beautiful. thanks for the inspiration and chance to win. I'm similar to Grisel who commented above. You always inspire me and I would soooo love to be able to make beautiful cards like you. Thank you. I cant explain how cute and pretty this card is Lucy. I love these colors so much. Thanks for inspiring and a chance to win. Such a darling card!! I think you picked the perfect combination of colors and embellishments!! Like YOU, I also LOVE ribbon and trims and never seem to have enough!! Such a cute card! Love that you used blue along with the pink, even though it's a card for a girl =) TFS! It's so cute. Love that pom pom ribbon too. Beyond cute - love the pom poms. Thanks for the chance to win. And again a lovely card, the colours fit so well on this card! What a great card - its so nice with the elephant and the heart pins, very cute! And your giveaway ribbon looks fab too. Oh, Lucy, how you inspire me! You have NO idea. I bought a sewing machine just because of YOU!! I adore everything you make. Like someone said above; you are at the top of my list of favorite card makers! I'm not just saying that because I want to win the giveaway...LOL! beautiful color and sweet elepant. Thanks for the giveaway. thanks for the chance to win some great ribbon! Such a fun card, and congrats! Thanks for the chance to win some of this fabulous trim! Love this card, can't believe the elephant is a sticker! Love the addition of the pins though! Such a sweet card, Lucy! Love the colors! Gorgeous card and fantastic colours! Adorable card! Love what you did with the pink heart pins, pom pom trim and sparkly sticker. Thanks for sharing your talent. Such a cute card - love that elephant and the heart stickpins! This card is just so gorgeous, and I absolutely love it. You´re such a huge inspiration always. Love this sweet card! Such a cute elephant. What a gorgeous card ,when I saw the colour combo I knew it wouldn't be easy .You put together everything perfectly.Clever you. So adorable, love that pink elephant! How sweet of you to giveaway those lovely ribbons. Thanks for the chance. Delightful card and delightful reason for one. Thanks for the chance; I enjoy your work. It's a sweet little elephant! Love the pins too! Thank you for the chance to win your lovely give away! Lovely colours and that wee elephant is so cute! I love the pom pom trim too, I've never seen it before, but will definitely have to go and buy some now! Such a pretty card,Lucy. I love this little elephant holding the pings and of course the beautiful trim. Thanks for the chance to win. I had already seen your card on The Ribbon Girl blog and I love it. Love the subtlety of that orange with the pink and the pom pom trim and heart pins look wonderful. 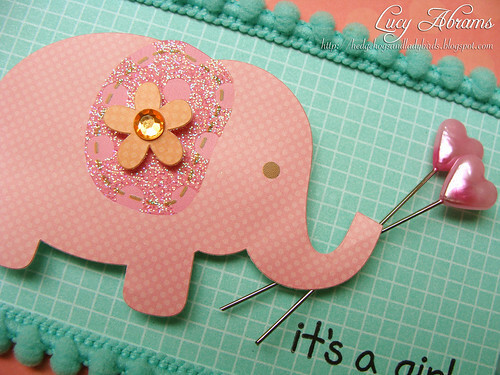 What a pretty card...love how the elephant is holding the pin flags! Thanks for the chance to win some great ribbon. Sweet sweet! Love those stickers! And your card is the cutest! Love the card, Lucy. I always marvel at your striking designs. Thanks for being a part of my day and for giving me the chance to win this beautiful ribbon! GORGEOUS card as always, Lucy!! !